For seven days, every February Sapporo is turned into a winter dreamland of crystal-like ice and white snow. The Sapporo Snow Festival, one of Japan’s largest winter events attracts nearly two million visitors who come to see the many snow and ice sculptures along Odori Park and the main street in Susukino. They include an array of intricate ice carvings as well as massive snow sculptures that are bigger than some of the city buildings. On this Hokkaido Winter Festivals Tour #3, we welcome in the 71st Sapporo Snow Festival, but this is only the beginning as we will be visiting a total of 5 festivals. 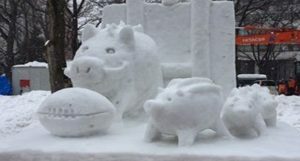 In additional to the Sapporo Snow Festival, we have the Susukino Ice Sculptures, Sairinka Light Up, The Sounkyo Ice Light Up Festival, and the Asahikawa Snow Festival. And yet there is more, much more, 3 onsen stays, a day visiting the historic harbor city of Otaru, 3 sake brewery visits, Asahikawa Zoo to witness the Penguin Walk, Sunagawa Highway Oasis for the very best omiyage shopping under one roof, 2 fish markets, Jogai Fish Market and Sapporo’s Nijo Fish Market, shopping and eating. If this wasn’t enough, how about 3 nights at Sapporo’s finest hotel, Century Royal Hotel Sapporo. Round trip air via Hawaiian Airlines. Seven nights in first class hotel accommodations. Inflight meals, breakfast daily at your hotel, 2 lunches & 3 dinners. 1 pair Snow straps per person. Final payment due by December 9th , 2019. Package is non-refundable after this date. 2/6/2020 – Depart Honolulu on Hawaiian Airlines flight 441 at 11:50 am and arrives in Chitose at 5:00 pm, 2/7. 2/14/2020 – Depart Chitose on Hawaiian Airlines flight 442 at 7:45 pm and arrives in Honolulu at 8:00 am (same day).